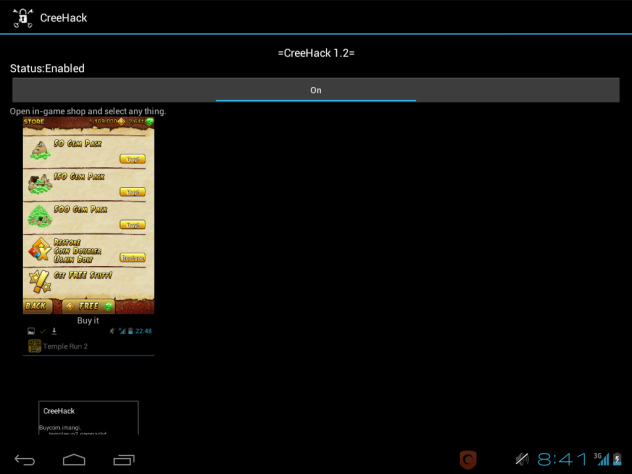 Hack Android Games and Apps and Enjoy Unlimited Coin and Gold using " Creehack " No Root Application. You don't have to gain any Root privilege, Just use this no root application in your Android. Today I am sharing an Application which is able to hack Unlimited Coin and Gold. It's name is Creehack. The main feature is it works in your Android without root permission. So you have no chance to brick your phone.. If you are already using Freedom then I wouldn't recommend Creehack, because Freedom hundred time better than Creehack. How to Use Creehack ? Install the application, click on, and minimize it! Just click the Pay and Boom! Payment Successful! Now Enjoy Unlimited Coin and Gold!